Mia and her best friends are up against a major super bully in this third adventure of the Mia Mayhem chapter book series! When a super annoying villain (who’s actually another superhero) arrives at THE PITS and accuses Mia of not belonging, Mia doesn’t know what to do. Will she be able to hold her ground when she goes up against the Super Bully? 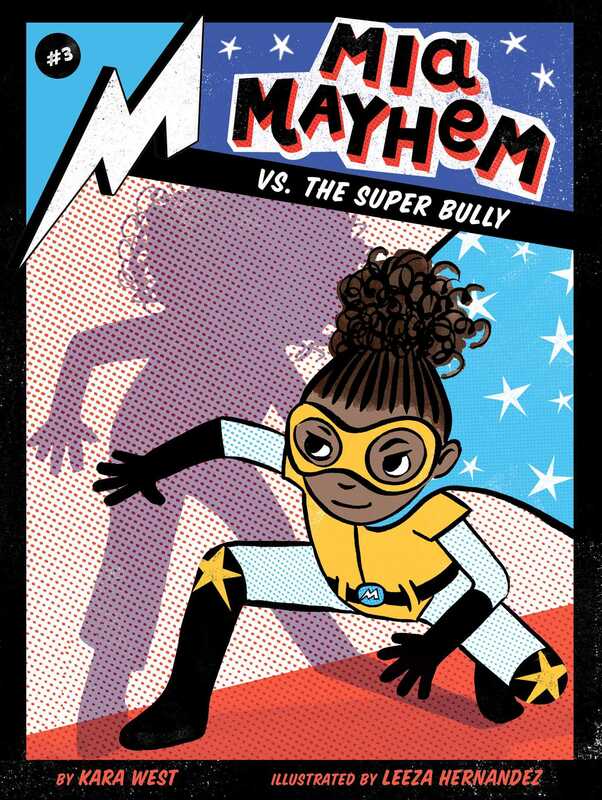 With easy-to-read language and illustrations on almost every page, the Mia Mayhem chapter books are perfect for emerging readers. Kara West would love to be a superhero, mostly so she ask squirrels what they’re so nervous about. She lives in Chicago with her own cats, who, unlike Chaos, spend more time sleeping than causing trouble. Thank goodness. Leeza Hernandez, an award-winning illustrator and now children’s book author, hails from the south of England, but has been living in New Jersey since 1999. She works as an art director at a local magazine and in her spare time, creatively noodles with new ideas for books in her art studio. She loves to experiment with printmaking, pen and ink, digital collage, and painting.